PLEASE NOTE: If you are not located in a coloured evacuation zone, your suburb will not be shown on the detailed maps below. *PLEASE NOTE >> The map above provides an overview only. Detailed map information by suburb is available in the list below. Identify your suburb from the list below. If you are not located in a coloured evacuation zone, your suburb will not be shown on the detailed maps below. Double click the map and use the zoom in tool for further map detail. You should now be able to identify what zone you're in. 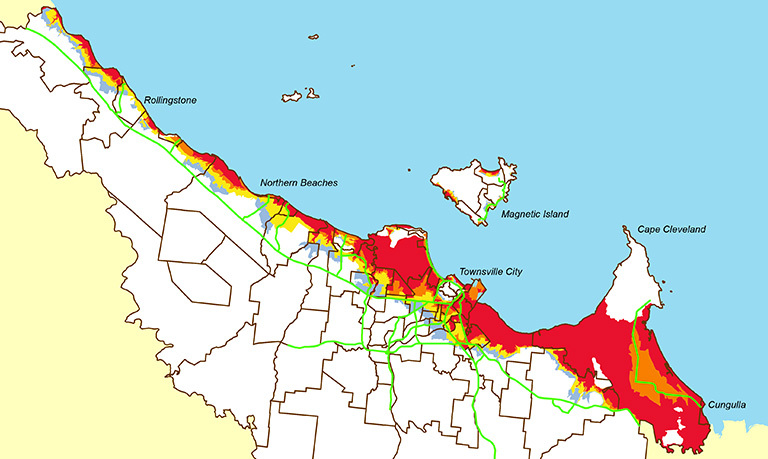 If you are in one of the coloured zones, you may be at risk from storm tide flooding during cyclones. Identify your evacuation route to your pre-determined safer location. During a cyclone event tune into warnings, authorities will advise which zones need to evacuate.